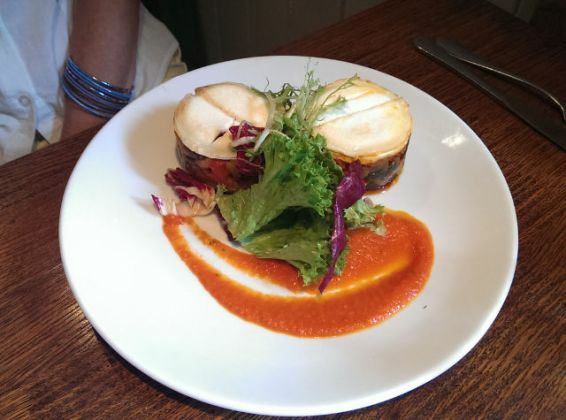 Claire and I had a good Sunday lunch at The Farmhouse in West Malling. 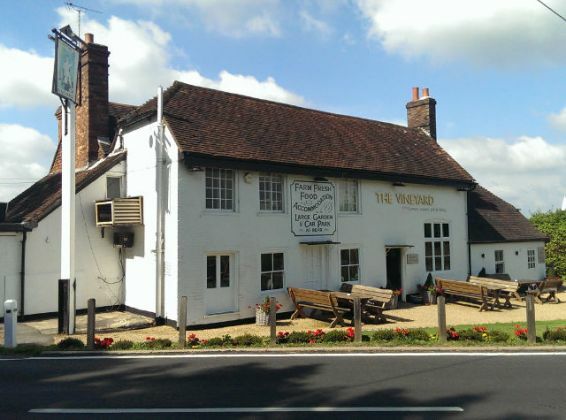 When deciding where to meet my Dad for lunch, I realised that Lamberhurst wasn’t too far away for both of us – I was interested to see how The Vineyard compared to it’s sister pub, The Farm House. Booking was simple – a quick call (and check they allow babies as well as dogs – they do), and we were all set for 12:15pm on Sunday. I haven’t ever been to Lamberhurst before, The Vineyard was set in some beautiful countryside. It was a pleasant change to use a large car park behind the pub, and it allowed us to see the extremely spacious garden. We were met immediately upon entering the pub and shown to our table ( a nice conversation with the waitress on route). Menus were given to us and a drinks order was taken (cheap date this time – soda waters all round (£0); Dad and Lesley had lime in theirs (£0.80 ish each)). Our drinks were brought out and we were asked if we wanted water for the table (which was served in a large jug). The venue had a lot of different facets – from almost private dining areas with wood panelling, through to light and airy restaurant areas. We were sitting in the “bar” area, with a view across the road and the green. In our area were a few tables, as well as a large fireplace with two huge leather settees (it still felt like a special restaurant even though we were in the dogs and babies section). In another spot, I noticed a set of antlers on the wall, being used as a hat stand! A lot of pictures were dotted around the restaurant and pub, ranging from fruit and food through to various scenes. The floors were slate, the walls were cream, and our table was laid out for us. Oh, and a very quick mention about the toilet – the freshest smelling ever! All in all, a top-notch venue so far. Menu choices were good, they accommodated the vegetarians, peskatarians and also (thankfully) the meat eaters. We almost went for starters, but decided to instead jump straight in to the mains. 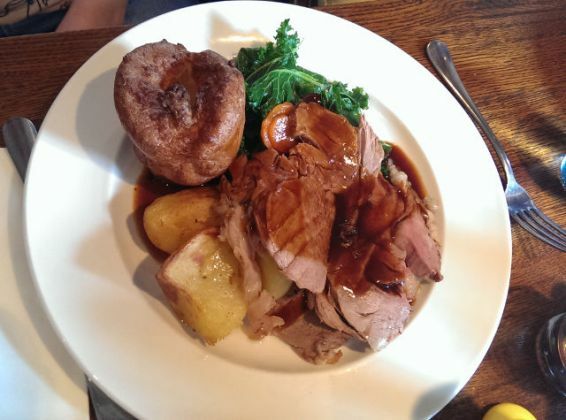 Claire ordered the Roast Lamb (£13.50 – which was seasoned with garlic, rosemary and anchovy! ), Lesley ordered the Grilled Vegetable and Goats Cheese Tian (£11.90), Dad asked for the Cornish Crab Linguine (£12.80) and I requested the Roast Beef (£13.95). I almost ordered the 3 meats, but recently I have been disappointed with this choice as all the meats blend into one under gravy which has meant I am unable to appreciate any of them (the pork did come with pork crackling, which almost swung it). Claire and I agreed to swap a slice of meat so we can at least have a semi-mixed meat roast. We ummed-and-arred about ordering bread and olives whilst waiting, but decided against it in the end. And a good job too, as the mains were served quite swiftly. Lesley remarked that her’s was a smiley face :-) She really enjoyed her dish, remarking that the vegetables were cooked just right (al dente). 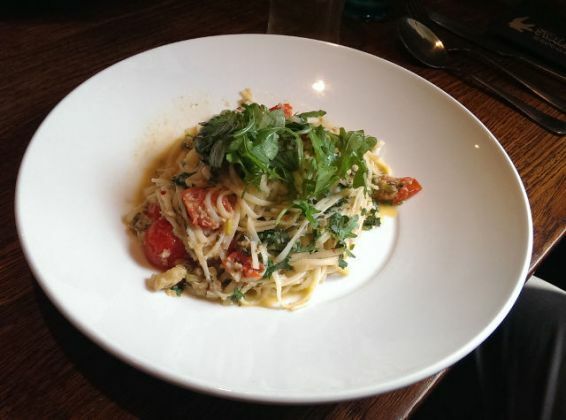 Dad was pleased with the Crab Linguine (he did ask for parmesan cheese) – said it had a great kick from the chilli. Now, on to our roast dinners… Both were impressive looking, I had 3 slices of beef, 3 large roast potatoes, a Yorkshire Pudding and a selection of vegetables. Claire’s was similar, with a fair bit of roast lamb. I am so pleased we agreed to swap a slice each – the lamb was superb. Such wonderful flavouring with a tender bite, it was probably the best lamb I had in a long time. My roast beef was nice, a bit disappointed that it was cooked closer to medium-well, but it wasn’t specified how it would come out. Burnt and crispy edges made up for it though, and the meat wasn’t tough. Claire did mention later that the lamb was quite fatty which meant less meat overall – it did explain how they were able to make it so tender, and we both agreed it was worth the sacrifice. The roast potatoes were a bit crispy and tasted nice, a lot of herbs were used when cooking. If I was being fussy, I would have liked them to have been cooked for a bit longer to really bring out the crispy-ness. The vegetable selection consisted of kale, carrots and courgettes. Kale was a very welcome addition – it’s one of my favourite vegetables. 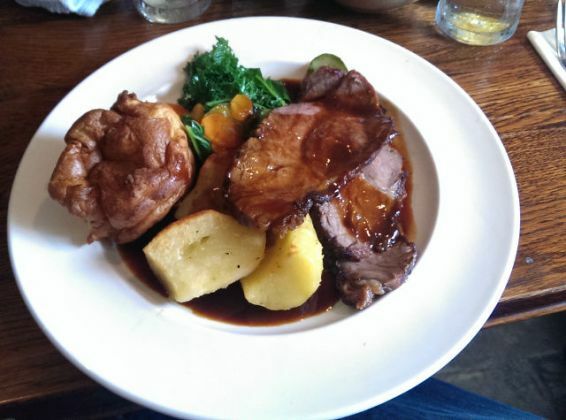 The Yorkshire pudding was very nice too – fresh and home-made, without a taste of oil. Lastly, the gravy – a thick consistency with a good flavour complimenting the rest of the meal. While we were eating, the waitress came over and asked if we wanted any more gravy, or any more vegetables! Now, that’s a great touch – I’d like to think we were not going to be charged extra for the veg if we wanted it, and more gravy was much appreciated. Service once again was swift. 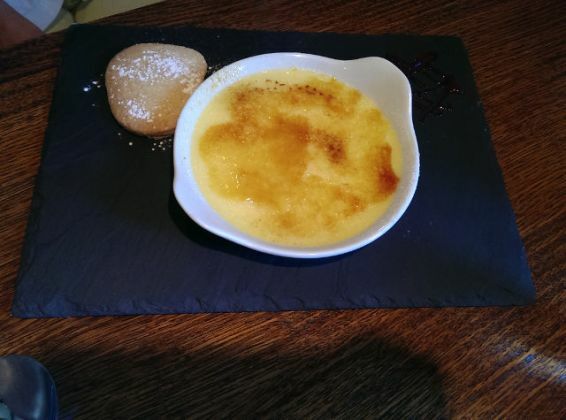 I was quite jealous of Lesley’s choice – presented on a slate plate, with shortbread on the side (it had a good tap and snap – very crispy on top of the crème brulée – the photo really doesn’t do it justice, my fault as I was took quick with the snap and sit down before anyone saw me). Claire’s lemon tart looked good, with a large amount of cream on top. A spoon of cheesecake with ice cream though and I was placated. It was amazing, such a rich rum taste with a good amount of sweetness – a dessert I could have every week! Dad was suitably pleased with his choice, as was Lesley. 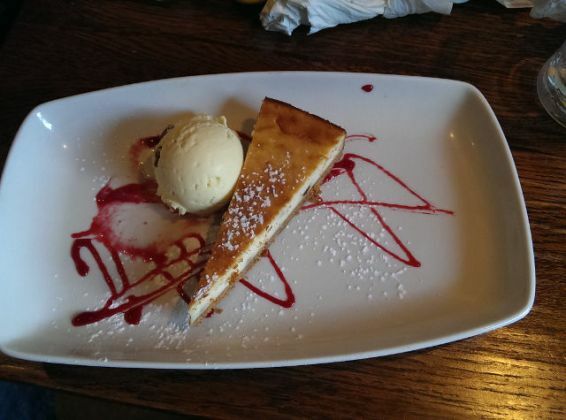 Claire’s lemon tart wasn’t as strong flavoured as she would have liked- the raspberry sauce gave it some extra flavour though and the pastry was nice and crispy. After our meal, we asked for the bill but also some hot drinks to have in the garden. A cappuccino (£3.00), Americano (£2.50) and a Lapsang Souchong (£2.40). All served outside where we could relax after a good meal. So, on to my conclusion. The service here was excellent – very friendly with good conversation throughout as well as being attentive (such as asking about extra gravy and vegetables). Even though this was the first time we had been here, we were made to feel like we were locals. 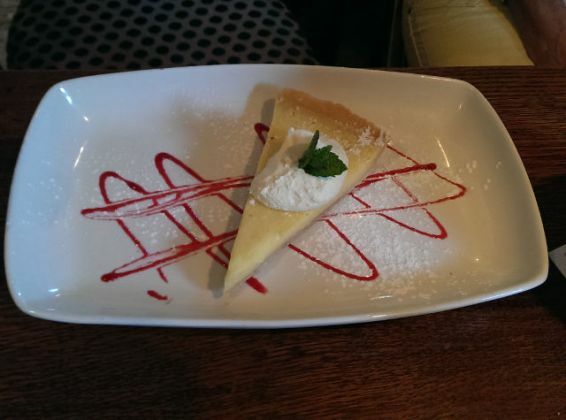 The food on the whole was very good – I would have preferred the option to have medium-rare beef, and the lemon tart could have done with slightly more taste – but large servings and excellent flavourings with the roast. The venue was vast with many different areas – it was busy, so make sure you book. A small but significant detail of the toilets being so clean and fresh shows the attention to detail with the venue. The huge garden meant we could relax after dinner. So, mild quibbles aside, the service, quality of food and venue means the Sunday lunch at The Vineyard definitely deserves a Top Rated award.